Before delving into some of the specifics, we believe it is worthwhile recapping where NGI has come from, to better appreciate some of the successes now becoming increasingly observable. It’s been quite a journey for the US-based Navigator Global Investments (NGI). Formerly known as HFA Holdings (HFA), NGI is the parent company of Lighthouse Investment Partners, a global absolute return hedge fund manager. Going all the way back to 2007, the then HFA branded business bought Lighthouse for approximately $750m (NGI’s market cap is now about A$560m). In doing so, the business became heavily indebted. The GFC ensued and NGI spent many years thereafter repairing the balance sheet. Importantly, the underlying Lighthouse Investment Partners business continued to grow and generate a healthy (and growing) stream of cash flow. Almost all cash flow was directed to the repayment of debt until it was extinguished in its entirety in 2015. Pleasingly, we now see a business that has no debt and more than A$55m of cash and investments on balance sheet. Reflecting on our own journey thus far, NGI has been one of the portfolio’s better performers in recent times. NGI has rallied strongly off its 2017 low of $1.94, and in doing so delivering a return well in excess of our objectives. So, while NGI may no longer be extremely cheap, we certainly don’t believe it is expensive either. This return, generated over a relatively short time frame, reflects a few things. Firstly, while also acknowledging we have the benefit of hindsight, it suggests that we acquired our part share of the business at a significant discount to intrinsic value. At the time, we were of the view that the discount was so meaningful that it would make a great deal of sense for NGI to consider a buyback, a view that was communicated to management. To their credit, NGI maintained their stated course of paying a healthy level of cash flow out as a dividend while concurrently reinvesting into both their global distribution network and product set. This investment is certainly yielding results. Secondly, it also reflects a meaningful return to growth, with assets under management (AUM) surging to US$10.5bn as at 31 December 2017. This compares favourably to its AUM of US$8.4bn just 18 months prior. We understand that performance and inflows remain constructive and as such, we expect AUM to be approaching US$11.0bn as at 31 March 2018. This is important for the valuation of NGI in that, when coupled with considerations around management fee margins and expense growth, it is the core driver of operating earnings. Charging a management fee on a growing pool of assets, supported by a relatively fixed cost base, can lead to significant operating leverage. In turn, this leads to the delivery of significant profit growth off comparatively less growth in revenue. Importantly, we see NGI emerging through this tipping point over the coming year or so. An interesting point of recent discussion, particularly post the market wide wobbles experienced in early February, is the increasing propensity for large scale pension funds, endowments and institutions to critically assess their asset allocation. We suspect this could well drive a transition of some ‘long only’ exposure (that has benefitted from a multi-year rally in the US market) to an asset allocation that encompasses more of a hedged, market neutral exposure. NGI management appear to be increasingly confident that many within their client base (existing and prospective) are actively considering the merits of this type of strategic refinement. If executed on a broader scale, such a trend could potentially form a potent tailwind for the operations of NGI. On current forecasts, we expect NGI to achieve organic growth in cash profits and dividends in the region of about 15% per annum over the medium term. We believe this sound rate of compound growth is at odds with a modest forward multiple of about 11.7x cash earnings and cash flow and a dividend yield of about 7.0% (Clime forecasts). Has an abundance of accumulated losses/deferred tax assets, and will therefore not pay any cash tax for many years. Looking ahead, we are expecting a stronger half on half result, largely reflecting positive AUM flows, investment performance and the absence of some one-off costs absorbed in the first half. Ultimately, this drives our forecast for FY2018 EBITDA and thus operating cash profit of ~US$35m (~A$45m). Mixed up in this year’s result is the impacts of President Trump’s recently announced changes in the US Federal corporate tax rate. NGI will incur a once-off, non-cash income tax expense adjustment in FY2018 of US$36.8 million due to the restatement of the Group’s US tax losses at the new tax rate of 21%. This will result in the Group reporting a statutory net operating loss after tax for the period. While this will superficially impact the reported result, we expect the underlying business will generate more revenue, more cash and again raise its dividend in the year/s to come. The recent US tax change will also provide longer dated benefits for NGI and its shareholders. An interesting scenario: Is NGI trading on less than 10x FY2019 cash earnings? What makes the above even more interesting is the acquisition of the ‘Advanced Strategy’ business unit of Mesirow Financial, which was announced post result. While terms and the amount of AUM to transition are yet to be finalised, we believe it is probable that this deal could be substantially accretive to per share earnings and perhaps more importantly, further strengthen NGI’s foundation for future business growth. 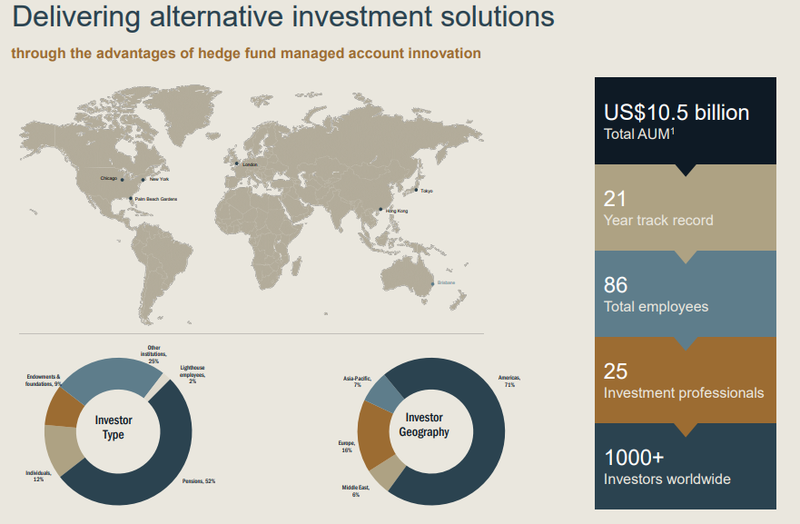 Mesirow currently has about US$8bn of AUM in its hedge fund division. The amount set to transition across to NGI will depend on the success of discussions with Mesirow’s existing client base. Though admittedly we are positively predisposed, we are of the view that the value proposition offered by a combined Navigator/Mesirow platform will be more compelling for key clients. We have modeled several scenarios, all of which incorporate an ‘earn out’ style of payment that will only effectively pay for AUM that successfully transitions (and sticks). This minimizes the amount of upfront payment required, while also reducing the potential for shareholder dilution (to perhaps zero). Given the strength of NGI’s net cash balance sheet, we believe the earn out payment to be made can and will be funded out of operating cash flow generated in the coming years. While sensitive to margin and cost assumptions, we can feasibly see a scenario whereby even if half of Mesirow’s AUM (i.e. US$4bn) transitions to NGI, earnings accretion in FY2019 and beyond could comfortably exceed 20%. We acknowledge that more information is required to forecast the outcome with a stronger degree of confidence, however, if such a scenario were to indeed prevail, NGI would be trading on a multiple of just 9.8x forecast FY2019 cash profit. With further information likely to be forthcoming over the coming six weeks, we look forward to providing further developments on this front in the coming quarter. For the various reasons stated above, we believe NGI offers value for investors seeking a sound mix of growth and income. Our FY2019 valuation range for NGI is $4.20 to $4.50 per share, which compares favourably to the current market price of $3.46 per share. Adrian Ezquerro is Portfolio Manager for the Clime Smaller Companies Fund.